AUTOMOTIVE NEWS: Magna has increased ?its r&d budget by ?US$100 million for this year, next year and the year after. What's making the company spend more? WALKER: In this business, you have to. That increase will specifically go into autonomous and electric vehicles. That's over what we were already spending, and it will continue for the next three years. It will probably continue after that, but we make these plans on a three-year basis. Don Walker is CEO of Magna International, the largest North American auto parts supplier, with US$38.95 billion in global sales to automakers in 2017. The Aurora, Ontario, company is diversified across multiple automotive technologies, including lighting, seating, electric vehicle systems, metal stamping and door latches. Through its Magna Steyr business in Graz, Austria, the company even engineers and manufactures vehicles for automakers. This year, Magna began production of Jaguar's first full-electric vehicle, the I-Pace. Walker, 61, spoke with News Editor Lindsay Chappell about Magna's plans and ideas. Q: In March, Magna invested US$200 million in an equity stake in Lyft. And Magna is partnering with Lyft to develop the mechanisms to make the ride-hailing company's vehicles autonomous. What's the plan? A: We are heavily involved in autonomous driving features at Level 2 and Level 3. And a company like Lyft is growing quickly and focusing on fully autonomous Level 5 driving. Companies like Lyft are the most motivated to get there since they have a business case. If they can replace drivers, they will get a payback. All that is going to be very expensive. But Lyft is already engaged. They've already pulled together a very good team in Silicon Valley, while Magna already has a lot of expertise in complete vehicles. Our Magna Steyr business designs and builds complete vehicles and understands all the systems. We have the ability to do all the sensors that will be necessary. So first, we want to be able to co-develop the technology to get to Level 4 and Level 5 — but we also want to apply our expertise to Level 2 and 3. Things like lane-keep and automatic braking, where there is a big demand already from consumers. How will Magna work with Lyft? We're co-developing the systems in Palo Alto, Calif., where they have a self-driving engineering center. They're taking the lead on software development. We will lead on vehicle systems, safety and the [advanced driver assistance systems] experience that we already have. We will jointly share the intellectual property that's created, and also use the Lyft data to improve the systems. Why is that part of it significant? That's a really big part of why we're doing it. They have so many vehicles out there running around and as they put these systems into them, you'll be able to test components. They have over 5 billion miles traveled on the Lyft network. Will Magna eventually develop an entire Lyft vehicle? It's too early to say that, and I wouldn't comment on it publicly. What they're interested in is getting the technology into the market, and you don't need to build the whole vehicle to do that. Would Magna also manufacture such a vehicle? Down the road, once you see the potential for really high volumes, customers might decide they want their own vehicles. In that case, Magna is the largest independent company that can engineer and build vehicles. But that's quite some ways down the road still. For now, most people who are looking at developing self-driving vehicles will use existing vehicles and just modify them. Magna also announced this year that it will develop the electric vehicle technology for BAIC in China. 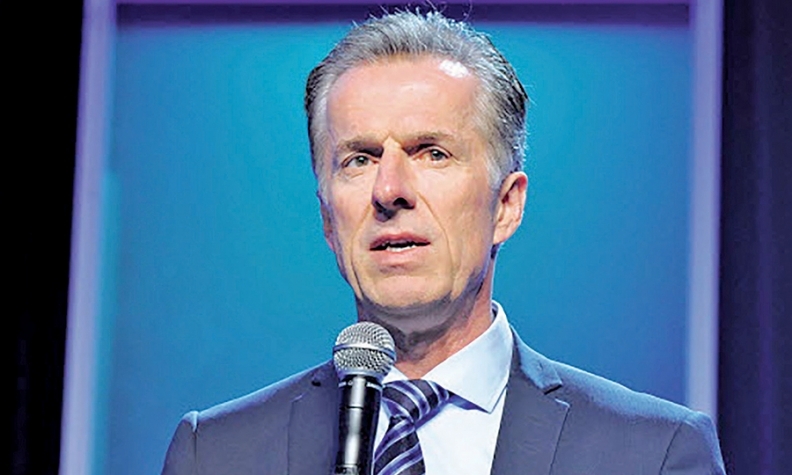 What exactly will Magna create for BAIC? China will be the biggest market in the world for pure electric vehicles because the Chinese government is pushing it. So in this case, because of our expertise, we're working with BAIC to help them bring a pure electric vehicle to market. We have a lot of activity already going on in China, and this was another step. We're working with them on the next generation of their EV architecture. Is Magna developing BAIC's entire vehicle? No, they already have the capabilities to engineer a vehicle. We're working with them on a new electric-vehicle architecture. I can't go into the details of it yet. But we have a lot of experience in both components and in the overall systems. So this is our Magna Steyr segment helping them bring a vehicle to market. When did Magna's EV capabilities reach this level of proficiency? We've been working on electric vehicles for at least 10 years now. We proposed the electric Focus to Ford 10 years ago and worked with them to develop it. It wasn't a ground-up electric vehicle, but we took out the internal combustion engine componentry and made it a pure electric vehicle. We took the lead on bringing that vehicle to market. We also worked with Volvo about eight years ago to create an electric rear-axle drive. And we've also signed a contract to develop an electric vehicle for Volkswagen in China. We bring that project the motors, the software, the electronics, the controller, the gearbox. So we have many years of expertise. Magna has been making big strides in developing solid-state lidar vision technology, and the company just won a contract from BMW. How critical is lidar to bringing autonomous vehicles to market? We're bringing to market a solid-state, high-definition radar and customers are showing a lot of interest in it. We also have recently gotten our first contract in lidar — that was for a technology from a company that we invested in early, called Innoviz. The current assumption is that if you want to have a fully autonomous driving car, you have to have camera-based, vision-based sensors. We're very big in the camera space. We've been in it for more than 10 years and we hold a lot of patents in it. You also need radar. Lidar is still a very small market in terms of dollars. To the extent that lidar performs as well as we think it can and the cost comes down, the solution will probably be camera-based plus radar-based plus lidar-based. Long term, I can see being able to do self-driving in places with snow just with radar, but for now you'll need lidar as well. Only last summer in a public presentation, you cautioned the industry that consumers would not move to electrification as quickly as many people believed. But things seem to be accelerating for Magna. Have world events changed your thinking? No, my views haven't changed much about that. Ten years ago, if you went to a car show you would've gotten the idea that every new vehicle was going to be an EV. What I expressed last year was that, even though we had contracts for electric vehicles, we're still quite a long time from that. Now, in the past year, things have begun to move a bit faster. But EVs are still too expensive. It's our expectation that by 2025, EVs will be only about five per cent of the market. By 2030, it's anybody's guess. Magna just opened an aluminum casting plant in Telford, England. Magna is a major supplier of stamped steel. How big of a transition will the company's stamping business undergo from steel to aluminum in the years ahead? We see a trend toward lightweighting, and that can come from a number of different materials: high-strength steel, stamped and welded aluminum or die-cast aluminum. Our metal-forming group, Cosma, is the largest in the world. We've already been moving into aluminum as our customers ask us to. Many of our Class A stamping lines have the ability to stamp aluminum. We purchased a company six years ago that introduced thin-wall, high-pressure aluminum die casting. We have three plants in Europe, a relatively new plant in Michigan with that capability, and we're also introducing it in China, as well as at a plant in the southern states. It's very high capital, and this technology is fairly unique, to create thin-wall precision parts. Will things all go aluminum? I don't think so. Whatever materials automakers want to use, we make all of them. Looking ahead, what are the most promising new product areas for Magna? Depending on what the customers are asking for is where we see the biggest growth. We're growing in lighting. Our latch business — which we refer to as closures — is going to be a huge growth area. You don't hear much about that. We're the leader in bringing electronic latches to the market. We now have them in production vehicles, and our customers understand that when you can redesign a door and go to an electronic latch, you can improve safety, reduce complexity, reduce weight and reduce cost, times four doors. We're also seeing a lot of customer interest in giving more business to our metal-forming business, Cosma. We have to make sure we can handle all the business we're taking on there. We're winning new contracts in things like complete tailgate packages and aero packages for fuel efficiency. In almost all of our businesses, we're seeing growth and that's why we're staying in them. If we don't, if we're not competitive in an area, we'll stop investing in it. What will Magna look like in 10 years? I want the culture to be the same. We always fine-tune it, and one of my greatest rewards is seeing that we are voted as a great company to work for. The products may shift, but I don't think there will be big changes there. We'll expand them as we look for more products in mobility. But I'd hope in 10 years people will look at Magna as the best innovation company when it comes to product, manufacturing practices and use of new materials.